What is Holocaust literature? When does it begin and how is it changing? Is there an essential core that consists of diaries, eyewitness accounts of the concentration camps, and tales of individual survival? Is it the same everywhere: West and East, in Australia as in the Americas, in poetry as in prose? Is this literature sacred and separate, or can it be studied alongside other responses to catastrophe? What works of Holocaust literature will be read a hundred years from now-and why? Here, for the first time, is a historical survey of Holocaust literature in all genres, countries, and major languages. Beginning in wartime, it proceeds from the literature of mobilization and mourning in the Free World to the vast literature produced in Nazi-occupied ghettos, bunkers and places of hiding, transit and concentration camps. No less remarkable is the new memorial literature that begins to take shape within weeks and months of the liberation. Moving from Europe to Israel, the United States, and beyond, the authors situate the writings by real and proxy witnesses within three distinct postwar periods:"communal memory," still internal and internecine; "provisional memory" in the 1960s and 1970s, when a self-conscious Holocaust genre is born; and "authorized memory," in which we live today. Twenty book covers-first editions in their original languages-and a guide to the"first hundred books" show the multilingual scope, historical depth, and artistic range of this extraordinary body of writing. What has long been needed was a guide that would be as accessible as it was comprehensive and scholarly. 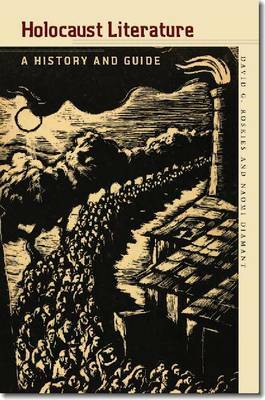 Now we have one, in Holocaust Literature: A History and a Guide . . . a book that offers us so much insight into how to read the literature of the Holocaust in time, and over time. Roskies and Diamant remind us of that it is not enough to preserve its memory; we must also make it available to be rediscovered by generations to come. JewishIdeasDaily.com"
"True to the book s subtitle, the authors follow their history with a Guide to the First Hundred Books. They highlight under-appreciated work from the earlier phases, and some readers may be surprised by some of their choices, such as John Hersey s The Wall (1950), which the authors signal for its value as a document of the early development of Holocaust literature in languages other than Hebrew and Yiddish, or Binjamin Wilkomirski s Fragments: Memories of a Wartime Childhood (1995), a fraudulent account that is included, at least in part, for what it reveals about the public s needs and expectations from Holocaust literature at a particular moment. The list s logic is informed by the authors innovative definition of Holocaust literature itself: Holocaust literature comprises all forms of writing, both documentary and discursive, and in any language, that have shaped the public memory of the Holocaust and been shaped by it. This is by no means light reading, but it is both accessible and powerful. Holocaust Literature offers something for a remarkable range of readers, from the scholarly expert for whom the repeated references to metonymy will resonate to the less experienced reader, who may simply seek to augment a reading list." Forward"
This book should be especially useful for those trying to get an overview of the development of Holocaust literature. . . . Recommended. Choice"
[An] ambitious and truly useful book, a history and also a reader s guide suitable for serious readers and scholars alike. . . .This book will be a standard reference work for years to come. Roskies and Diamant have succeeded in writing a remarkably comprehensive yet concise history of Holocaust literature, as they have defined it, which recoups its roots and branches in a multitude of languages. H-JUDAIC"
The author s comprehensive research and analysis put the individual works and the body of Holocaust literature into both a historical and literary context. . . . An essential acquisition for Holocaust Centers and large Holocaust collections, the book is a valuable resource for research and book selection and is recommended for all Jewish libraries. Association of Jewish Libraries Reviews"
[An] extraordinarily rich and sophisticated discussion. . . . Roskies and Diamant s arguments are passionate and eloquent, and their evidence is massive and convincing. Their resourceful marshaling of a wealth of materials originally written in twelve languages enables them to pursue incisive comparative analysis. Slavic and East European Journal"